Tomorrow is the UN International Day of Solidarity with the Palestinian People. We and our friends at Kairos USA will be delivering more than 30,000 signatures of support to the 15 courageous church leaders who called on Congress to investigate Israel's misuse of U.S. weapons. If you're in DC, please join us for a press conference tomorrow, Thursday, November 29 at 10:00am at the United Methodist Building, 100 Maryland Ave. NE. If you can't make it in person, watch the live-stream of the event from anywhere in the world. Calls for ending military aid to Israel are increasing, especially after this latest assault on Gaza that killed 130 Palestinians, including 30 children. Today 52 leading international figures released a statement "Now is the time for a military embargo on Israel!" Military ties with Israel have fueled relentless acts of aggression. Israel continues to entrench its subjugation of Palestinians while provoking or initiating armed conflict with its neighbors in the region. Israel’s attempt to justify this kind of illegal use of belligerent and disproportionate military force as “self-defense” does not stand up to legal — or moral — scrutiny, as states cannot invoke self-defense for acts that serve to defend an unlawful situation which they have created in the first place. We therefore support the call from Palestinian civil society for an urgent and comprehensive military embargo on Israel as an effective, non-violent measure to stop Israel’s wars and repression and to bring about Israel’s compliance with its obligations under international law. This is now a moral and legal imperative to achieve a just and comprehensive peace. Signatories include Nobel Peace laureates Mairead Maguire and Adolfo Perez Esquível, former Pink Floyd front man Roger Waters, Directors Mike Leigh and Ken Loach, Pulitzer Prize winner Alice Walker, international best-seller Naomi Klein and co-drafter of the 1948 Universal Declaration of Human Rights and Holocaust survivor Stéphane Hessel. Read the full letter with complete list of signatories. 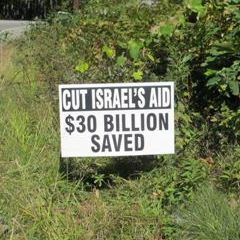 You can organize to end U.S. military aid to Israel by signing up on our website. Petition: No to Technion in NYC!